We've been visiting RV friend, Gloria, in Bend. This is the view from the deck of her daughter's house where she is house-sitting and waiting for renovations on her house to be made. The neighbors provide a retirement home for race horses. The house sits high on lava rock deposited from an ancient volcano eruption. I loved the surround deck with great views on all sides. 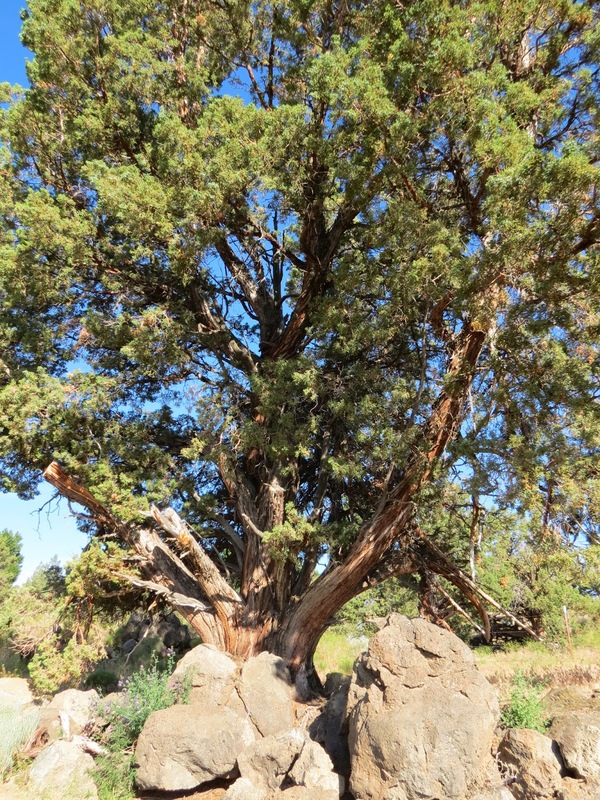 The 40-acre property is dotted with gnarly old cedar trees growing through the lava. The view on this side overlooks an old corral and in the distance a neighbor who raises bison. We had a level, quiet spot to park in back. There are two duck ponds on the property and a family of Mallards. Becker's White Butterfly...new one to me, sitting on stickers that get in Thistle's fur. Gloria, Birdie and I took a day trip to the nearby High Desert Museum. 1914 Model T Ford inside the museum. On the grounds is an historic circa 1904 ranch and lumber mill. Interesting sculptures are found along the outdoor walkways. This mare and foal are made entirely of barbed wire. A pair of Roosevelt Elk. And real turtles by the pond. We watched the raptor show, where birds were introduced in free flight. This is a barn owl flying in. A new falcon to me....Birdie knows what kind. We walked through the old Miller ranch. Where costumed re-enactors talked about life there in 1904. Mrs. Miller was proud of her Ivory soap....so much nicer than the harsh lye soap they made. He had a cure for almost everything. On the way home we stopped at a fresh produce market...really juicy fruit. I got my RV serviced. Birdie got new coach batteries and a roof rack for her new kayoo that's being shipped out here. I'll let her tell you about the other new things she bought. Then today, we knew we were in Oregon...it rained! But we went exploring and found another great kayaking lake, recommended by the kayak rack guy. Sparks Lake is another one created by an ancient volcano. And it is surrounded by interesting lava forms. The lava has created many inlets to explore around the edge. You'll have to imagine the blue sky and reflections of the snow-capped Sisters Mountains. But when the rain stops, we'll come back for a few days to paddle here. And we discovered there are many more lakes nearby to explore the next time I come to Oregon. So glad to see you enjoying some time with Gloria. It really is beautiful there.